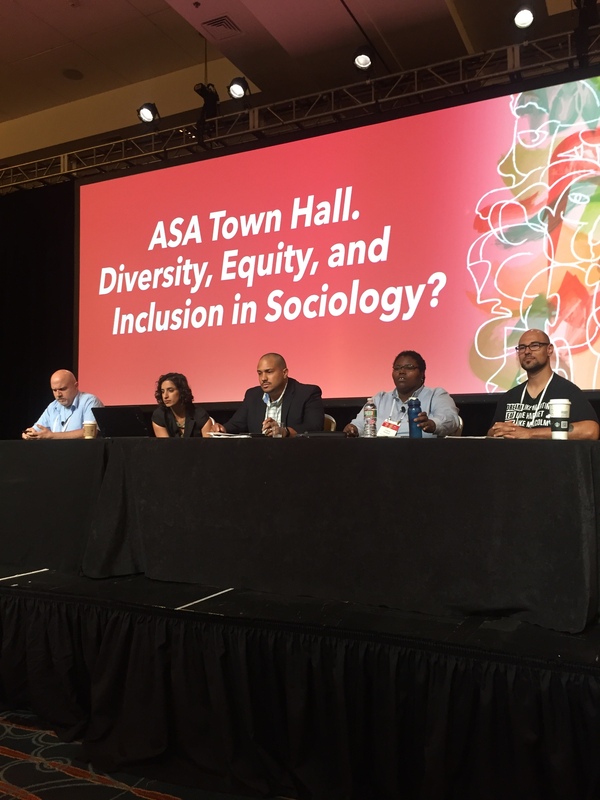 Education « Eric Anthony Grollman, Ph.D.
Last week, I served as a panelist on a townhall on diversity, inclusion, and equity in the discipline of sociology at the 2018 annual meeting of the American Sociological Association (ASA) in Philadelphia, PA. I was kindly invited to participate in this important conversation by organizers Dr. Victor Ray (@victorerikray) and David G. Embrick (@dgembrick), and ASA president Eduardo Bonilla-Silva. Presided by Dr. Austin W. Ashe, the townhall also featured fellow panelists Drs. Antonia M. Randolph (@baldwinvidal), Salvador Vidal-Ortiz (@svidalortiz), Ted Thornhill (@profthornhill), and Natasha Kumar Warikoo (@nkwarikoo). As part of my commitment to breakdown the paywalls of academic journals, classrooms, and conferences, I share my remarks from the townhall below. The failure of sociology to become a truly diverse and inclusive discipline is partly due to its aversion to scholar-activism. 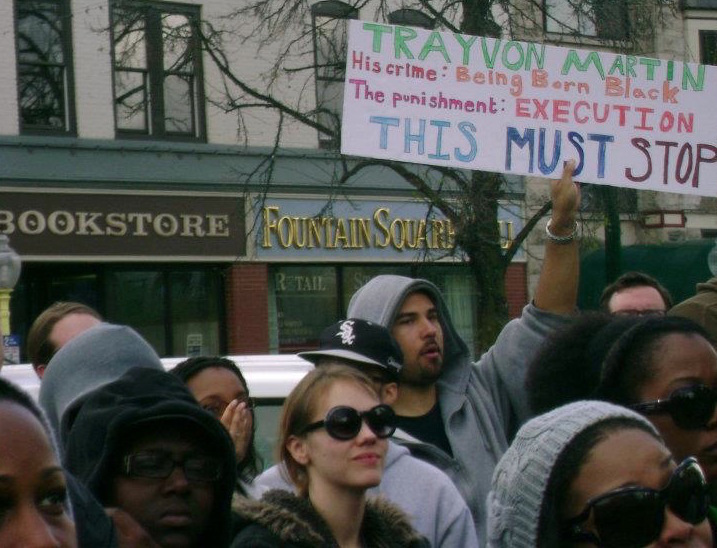 Thus, the disciplinary project to diversify sociology requires us to embrace activism. This is a simple point, but it remains a controversial one in sociology, especially within ASA. Unfortunately, I know well the antipathy that many sociologists harbor toward scholar-activism. Early in my graduate training in sociology at Indiana University (IU), I was explicitly told that the goal of the program was to “beat the activist out” of me — some sort of bizarre twist on exorcism or conversion therapy. In my last year at IU, Professor Fabio Rojas wrote a blog post to me on OrgTheory.net, entitled “Why Activism and Academia Don’t Mix.” While his intentions were well-meaning, I found it unsettling to have a professor in my department publicly put me on blast just months before I finished my PhD and started a tenure-track job. When I pitched a joint ASA session between the Sexualities and Social Psychology sections, my main advisor snidely responded, “OK, Mr. Activist.” Somehow even putting academic subfields into conversation with one another constituted activism; the bar for what was subjected to the slur of “activist” seemed to fall lower and lower. It took me years post-PhD to acknowledge how frequently my grad school professors used shame as part of their effort to train me. Perhaps its even fair to use the term gaslighting to describe this professional socialization. No matter the term used to describe this intellectual violence, or their intentions, the impact was severe: I continue to work through complex trauma even five years since I graduated. Throughout my career, I have repeatedly been told that my research on LGBTQ communities and communities of color is nothing more than “me-search” – work that is suspect because it is on communities to which I belong. Once I was told my interests are “too narrow” by a white person who now has even narrower research interests than me. Apparently sociology only values work that is exclusively or at least partially related to privileged people. 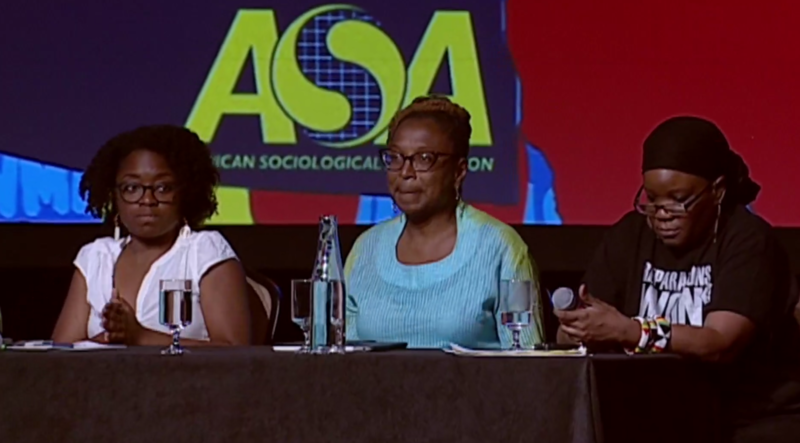 Image: Charlene Carruthers, Kimberlé Crenshaw, and Mariame Kaba, panelists on the 2016 ASA Presidential Plenary, Protesting Racism. Presider Aldon Morris then opened the floor for Q&A, around 01:26:00. With just 10 minutes remaining in the plenary, Dr. Morris took four questions and then asked the panelists to respond to them collectively. The first question came from fellow IU alum Dr. Abigail A. Sewell (@aasewell). Dr. Sewell remarked that they were an activist long before becoming a sociologist, though they came to sociology under the assumption that it would be a transformative discipline. Their expectations were not met; but, it was through Black Lives Matter protests that Dr. Sewell remembered that the Black radical tradition persists – but, apparently this lesson was learned “on the streets” (through protests), not “in the books” (through their sociological training). Image: A June 2, 2017 tweet by Professor Joshua T. McCabe (@JoshuaTMcCabe) that reads “Dear fellow sociologists: Please stop doing this. I just want a professional organization focused on scholarship” in response to ASA Presidential Candidate, Dr. Mary Romero’s personal statement calling for scholar-activism. The following year (2017), the discipline’s double standard for public sociology versus scholar-activism became more apparent to me. For example, last year, Professor Joshua T. McCabe (@JoshuaTMcCabe) tweeted, “Dear fellow sociologists: Please stop doing this. I just want a professional organization focused on scholarship.” The “this” to which he was referring was then-ASA presidential candidate Dr. Mary Romero’s personal statement, which promised a commitment to scholar-activism. Surprisingly, McCabe engages in public sociology, prominently displayed on his personal website, including essays he has written for National Review. (I and several others shared his tweet, and many responded to him. A year later, he accused me of leading Twitter mob violence against him.) For years, ASA has furthered its commitment to public sociology, even calling upon sociology departments and universities to consider this work as part of considerations for tenure, promotion, and merit review. To my surprise, the words “activist” and “activism” never appear in this report. At the root of the activism-versus-academia debate in sociology is the discipline’s refusal to embrace the work of marginalized scholars as legitimate sociological work. Sociologists who are white, men, cis, heterosexual, wealthy, and currently without disabilities – and especially those who hold multiple or all of these identities – act as gatekeepers who wield power to determine what counts as legitimate sociology and what doesn’t, who is a legitimate sociologist and who isn’t. The dominant way of being a sociologist – seemingly detached, objective, apolitical – has long kept out critical scholars and scholar-activists, folks who are disproportionately of color, cis women, queer and trans people, first-gen, working-class, and people with disabilities. This ideology was used to justify excluding Dr. W. E. B. DuBois from the discipline, and subsequently erasing his contributions as part of the “classics” in sociology. Dr. Aldon Morris notes in his book, The Scholar Denied, “Many contemporary scholars claimed that by educating the public in the Crisis [magazine], Du Bois was no longer acting as a scholar but had turned propagandist.” Former ASA President Joe Feagin’s (@JoeFeagin) 2000 presidential address turned 2001 ASR article, “Social Justice and Sociology in the 21st Century,” recounts the discipline’s move toward positivism, which was also a time when white men solidified their dominance in sociology departments. Excluding activism is antithetical to diversifying sociology. 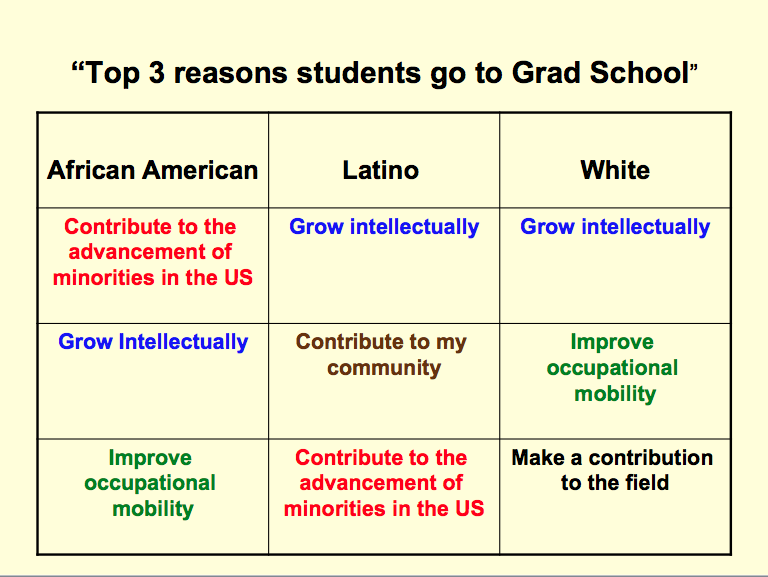 Image: Top three reasons students go to graduate school for African American, Latinx, and non-Hispanic white students. Today, the discipline’s aversion to activism runs counter to the reasons why most Black and Latinx folks pursue PhDs in sociology. As Dr. Denise A. Sagura found in a 2009 study of 700 PhD students (see Powerpoint presentation here), the top reason African Americans report for attending graduate school is to contribute to the advancement of minorities in the US, and the second and third most important reasons cited by Latinx students is to contribute to their community and contribute to the advancement of minorities in the US, respectively. The top three reasons cited by non-Hispanic whites were: 1) to grow intellectually, 2) to improve their personal occupational mobility, and 3) to make a contribution to the field – in other words, motivations not driven by a concern for making a difference in society. To ignore what motivates people of color to become sociologists means that the discipline continues to center the interests of non-Hispanic whites. It means people of color – as well as other marginalized groups – find success in sociology by mainstream standards on the condition that they downplay their commitment to activism. Perhaps it means that those who refuse to conform drop out of grad school, leave faculty positions, leave the discipline, or leave academia. To reverse this potential “brain-drain,” to cease forcing scholar-activists to conform or hide their activism, to end the practice of privileged scholars serving as gatekeepers who dismiss marginalized scholar-activists’ work as “me-search,” we are long overdue for embracing scholar-activism as a legitimate type of sociology. We are overdue for recognizing the contributions of DuBois, Anna Julia Cooper, Jane Addams, Ida B. Wells-Barnett, Joyce Ladner, and other marginalized scholar-activists to the discipline. In this increasingly post-truth, anti-science, anti-union, xenophobic, white supremacist, misogynistic, cis- and heterosexist climate – failing to embrace activism may be at our own peril. Since age 5, or even birth — but, really only recently. Am I making any sense? If not, it is because I have yet to make sense of my gender identity and expression for myself. I was 5 years old when I first acknowledged that my own sense of self, interests, and experiences bear little resemblance to what we define as “man” and “masculinity.” Early on, I knew that I wasn’t like other boys, and later learned that I like other boys. So, adopting a bisexual, and then gay, sexual identity made sense. But, with exposure to LGBT and women’s studies in college, I knew my uniqueness transcends whom I find attractive. So, upon discovering genderqueerness, I adopted that as my own, and began identifying as queer more broadly. Queer as an identity reflects my attraction to masculinities (no matter the bodies that expresses them) and maleness (no matter the genders it expresses); it also reflects that I do not neatly fit into the category of “man” (nor “woman” for that matter). Joining the cult of academia, beginning with my graduate studies, proved to be a hard-right turn in my intellectual, professional, and personal development. There were blips of authenticity, resistance, and fierceness. I had a tongue ring for a month. Had both ears (re)pierced for a few months. Did a little drag. But, as I attempted to advance professionally, I caved to the pressures to be gender-conforming — both in my appearance and in my scholarship. As a researcher, I write with unwavering authority. When I present at academic conferences, I no longer bang on the podium, despite my internal anger about the issues of my research — discrimination, violence, oppression. Slowly, I have moved away from the full suit and tie look to teach, but that really just means no tie. As a fat Black/multiracial genderqueer person, the implicit and explicit pressures to sever ties with my own identities, politics, and communities for the sake of professional success proved traumatizing. My own parents’ hesitation to accept my queer sexuality when I came out at 17 pales in comparison to the misery of graduate school. I am closer with my parents today than ever in my life — even after recently coming out as non-binary to them. (Mom: “Hmm, I saw this coming.” Dad: “Non-binary? What the hell is binary? !”) My grad school advisors… not so much, despite their supposed life-long investment in my career. And, I imagine the more I veer away from my training, the less likely they’ll care what becomes of me. In their eyes, it was my career to throw away, anyhow. Late in my first year of college, I stopped taking calls from my parents. I made clear that they either accepted all of me or none of me. I was tired of lecturing them in public spaces about why I was taking classes in queer studies and “insisted” on being publicly out. My Dad eventually drove the 45 minutes to see me. (I wouldn’t have agreed to see him, but my dorm’s front desk called my room and said, “there is a cop here to see you!”) Refusing to look him in the eyes, I told him I was on full scholarship and could figure out summers, so I didn’t need them anymore. I didn’t see his heart break a little every time I said that. Eventually, he got through to me, we had a nice heart-to-heart over lackluster pizza, and have been close since. I wish I had been as cavalier with my grad school advisors. Sure, I pushed back, and eventually took my current position despite their opposition. But, I only rarely stood up for myself, and regularly caved or at least tried to compromise. Their voices, with their goals for my career, remain in my brain. By design, grad school is about professional socialization — that is, a systematic program of teaching new values and ways of viewing and behaving in the world. And, the program was somewhat successful in re-programming me. But, not enough to do so completely. I am like Seven of Nine on Star Trek: Voyager; my scars are reminders that I once was Borg, and occasionally the Borg way of thinking trumps an independent perspective. (No, I’m not a Trekkie. Well, you can say I’m a second-generation Trekkie. I’m fairly fluent, but only talk Star Trek with my father.) So, even in deciding to write this essay after much back-and-forth, I feel I have a mini fierce queer activist on my left shoulder who is constantly reading the mini R1 minion on my right shoulder for filth. On my right, I hear, “but you’re a professor! Professors don’t write personal blog posts like this! Professors don’t blog! Professors aren’t trans…” And, there it is. The transphobic roots of my academic training. But, why publicly? Why risk the potential consequences of transphobic and queerphobic discrimination in my profession? I won’t try to convince others of the benefits of baring your soul on the internet. But, for me, I feel a sense of release when I push back on the social forces that are constraining me, erasing me, killing me. Why should I privately struggle through the transphobia and cissexism that I have internalized when these are forces that affect us all? I know that I am not alone. I write because there may be others out there struggling, too. And, I know I’ll likely hear more hostility or at least crickets than any sort of appreciation. And, it’s not about feeling appreciated. It’s about sharing my journey with others — perhaps even those who will simply read and learn. To ignore the critics, and haters, and trolls, and bigots, and nay-sayers, I now just write for me — the me of the past who wishes he had stumble upon a professor who spoke so openly about their gender journey. I write for the future me — the me of 10 years from now who has no regrets, and sees sharing such vulnerability and uncertainty as just what you do. Thank you for tuning into my journey.